Evolv, Inc > Categories > General Discussion > Whats the reason why the board becomes dead ? Whats the reason why the board becomes dead ? I have had two now while vaping no errors messages. I put the same atty on my sx mini m class and work fine so it cant be that. 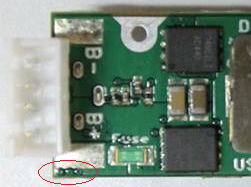 For your board mounting, at the button opposite of the battery + is there anything between that metal support and the board? The board is not designed to have a mounting point on that side, so I would try to insulate it. Also, what are you using to hold the screen? Right now the two biggest issues we are seeing with the VAST majority of returns is one, soldering too cool, for too long and heating the entire board, or soldering too long due to not pre-tinning wires and pre-flowing solder onto pads. I like to solder very hot, very fast in order to avoid heating any surrounding areas. Two, and this is the big one so far, is people using all manner of glues, epoxies, etc. Anything solvent based is a BIG no no especially. Anything other than an electronics grade epoxy or electronic grade RTV/Silicone can and will compromise your board and its components. Electronics grade RTV/Silicone is likely everyone's best bet as electronics grade glue and epoxy is very expensive. Hi Nick thanks for your reply so what your saying is this mount shouldn't be earthed to the case ? Hi David, you should be fine earthing to the case as long as nothing can short to the case. From the new angle you just posted I see that what I had previously though was some kind of pad or platform milled into the box to support the board is actually the USB port. That all looks good. Also, I cannot really tell how many wires are coming off of the 4 pin balance tap. Do you have all 4 wires for 3 2 1 GND ran, or did you bridge 3 to B+ and GND to B-? This is something we are seeing people do a lot, and it should not be done due to voltage/sag drop on the B +/- wires under load when firing. That is a great picture, would you mind doing the same for the other side of the board? 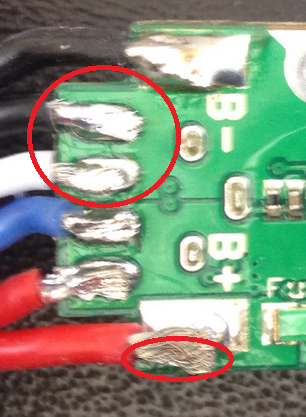 I can see a couple of potential issues with the first picture, there loose strands from the black balance wire and the positive battery wire is over 3 vias (look like holes in the board, but connections that connect the different layers of circuit board) that are know to cause a problem if the solder here contacts them. These are the vias David, sorry I can't see from your picture. I see, it is hard to get the photos. I've had two boards die myself. Both at around a month old. The first just quit mid vape, and the replacement made a pop and then died. I looked for any shorts or bad solder joints. No errors or messages. It would be nice to get a quick note with the replacement to let me know what the issue was. Best I can tell neither were user error, but I would like to know for sure so I can prevent the error from reoccurring. I couldn't find any "electronic grade" RTV is Sugru (Silicon putty) OK? 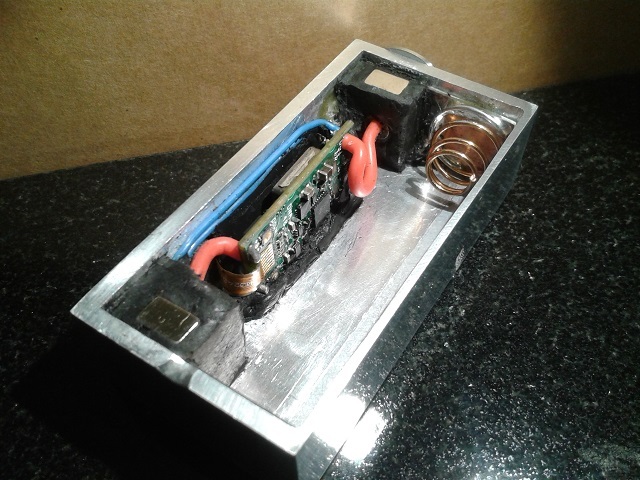 I built this DNA40 350 days ago and it has heavy use with no problems, the Sugru is the black stuff in the photo. Edit: I found some Servisol Silicone Adhesive Sealant which seems to be OK, but would like to know about Sugru's suitability.